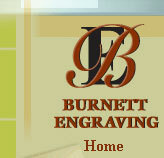 Welcome to Burnett Engraving Online! Welcome to Burnett Engraving! Located in Anaheim, we have been one of the premier engravers of stationery for over 42 years. When we expanded our offset printing services to include large format full color printing, our new clients were assured of the same attentive service and exacting standards of quality to which our engraving clients have become accustomed. The combination of small and large format thermography units, foil stamping, embossing, diecutting and engraving makes Burnett Engraving a one stop shop for all your printing needs. And because we do it all in-house, our pricing is extremely competitive.